PA day tripping... let's see where you went! Discussion in 'Northeast - Greater Flugistan and home of the carp' started by NurseBill, May 20, 2018. Let's see your PA day trips. Give me and others something to go and try and see. Please put locations. I had this post in BEST Roads but it kind of doesn't fit there. Spent today street riding with some dirt roads. Ran a bunch of 522, 16, 456, ended up in Maryland a little. Rode a bit of 30 from McConnellsburg to Bedford for no real reason and headed home through Altoona. Saw James Buchanan's childhood home and his birthplace state park near Mercersburg PA. And some out of the way civil war graves and basically had a good day. racersinc, wmfleet2, SoPaRider and 1 other person like this. Civil war graves and bivouac locations in Mc Connellsburg PA. The graves are on Rt 16 and the bivouac site is on 522 South. DirtMedic, Tall Man, SherpaT and 3 others like this. Took my first solo ride outside of philly after the rain on Sunday. I've been eyeing up some trails on google earth and decided to explore. It was a great find...a few other riders out there, some duals, some quads. Everyone was chill and happy...and said cops rarely show up. Took a little spin, quickly realized my street tires were no match for the mud and decided to head out. Right before the trail out was a little patch of water, thought I would cruise right through....wrong. I'm 50 minutes from home, solo, way back in the woods with a dead bike and all my other biker friends out of tow. It's approaching dark with 10% battery on my phone (so many stupid mistakes this day). The last thing I wanted to do was call my wife to come get me. After a "calm down" I gave it one last go. SUCCESS! With a glorious blow of some white smoke, which eventually faded, the old beast fired back up. Road it back in to philly with, what seemed like, normal functionality. Now it's time to dig in and clean her up. Oil flush and filter, probably drain gas, new air filter, and grease it. I think I'm in good shape with the bike but only time will tell. I got extremely lucky this weekend and also learned a lot of lessons. It's all fun and games until your sunk in a pseudo homeless encampment outside of philly. Stay safe and smart out there friends. And play with buddies. fatbikeracer, Tammy, NurseBill and 1 other person like this. Your going to do it again only next time your going to say been here done this before I got this... Some of our worst rides make up our best memories..
drbuzzard, SloRonStinkypants, cyclejohn and 4 others like this. I do a loop from Fivepointville via Maple Grove rd, Alleghenyville rd to Plowville then on Plow rd, Rock Hollow rd, right onto Hay Creek rd to Elverson rd to 23 then 345 north. Right onto Giegertown rd to Hay Creek rd to complete the French Crrek loop. Then double back the same way I came out. Doug Just Doug and NurseBill like this. There are not many places that close to Philly except for the Pine Barrens and the Poconos. I flatted 3x in a PB500 Rallye about 7 or 8 years ago. I got the first two fixed and then was out of tubes and out of hope. After one of the last riders passed, I sat by the bike for about 2 hours and it started getting dark. There was NO cell service and I was not going to abandon my bike in the woods. One of the riders that had passed said they would send a rescue truck but that did not happen. Luckily I teach survival skills - the fire was easy to make, but it might have been a bit uncomfortable sleeping out for the night! Here is a selfie taken at the scene - so they could identify my remains - ha ha. WindBlast, Gundy, stbob and 5 others like this. I had a couple recent day trips through the Bald Eagle State Forest. One was solo on Memorial day and one with 3 guys on GS1200's . Just a few highlights. It's a great place to Dual Sport. Located in Mifflin, Centre, Snyder and Union counties. drbuzzard, FDSR_MIKE, PA Dewayne and 1 other person like this. My other after work loop is west out Denver on Mountain Rd, hook a left on Pinch then the next right. This will dump you at Elizabethtown Rd. Take this to Colebrook then north to 322. A quick right then left onto 937 (i think) to Ft Indiantown Gap. Left at the railcar then right onto 443. Follow that all the way to across 81 and hook a right onto 645 and down to Myerstown. Were you at Touratech last year? I rode with a guy who had an HP2. 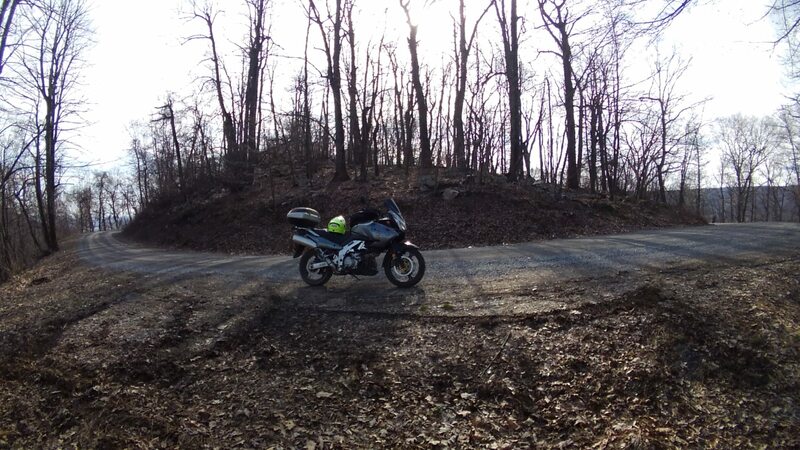 Yep - I was riding the HP2 with the black rims at that rallye and have only ridden out in that north central PA area a couple of times. It is a really amazing part of the state. I did the Touratech rallye all three years and was a sweep rider the first two years. Sad that it is not happening this year. PA Dewayne and NurseBill like this. I don't remember if you rode with me or not. I think I rode 6 the one day it poured like a B and 7 the next or vise versa. Kind of pointless to do any of the other rides on my bike. Someone poked a hole in a valve cover day 2 and day 1 a guy on a KLR punched a hole in the gas tank with a dead tree. Good times. Not real happy they aren't having it this year either. I mean I live like 20 -30 minutes from the start site and I can ride the stuff any time I can but it's kind of cool to ride with a ton of folks from all over. Anyone know of any good swimming holes for a day trip from Philly? For you or the bike? For you French Creek or Mt. Gretna. Not sure what the cost is for them. For the bike I have no idea. Here's one of my local, go-to rides. 70 miles of mind clearing fun. Sno Dawg and NurseBill like this. We rode a 136 mile loop on Saturday in Fulton and Bedford Counties. We started and finished on US 30 at the Sidling Hill Picnic Area. We ate a late lunch at the Road Kill Cafe and dropped down into Maryland for high test fuel. The worked our way back to US 30. Do you have a .GPX for that ride? Looks like a good one! I think French Creek is where I'm headed. The swim is for me. The bike gets a ride in the rain as circumstances allow. drbuzzard, GravelTrap1000, wmfleet2 and 1 other person like this.